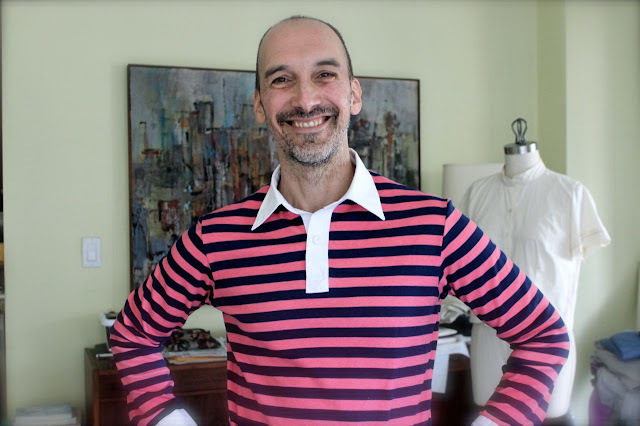 male pattern boldness: An Organic Cotton Striped Rugby Shirt! 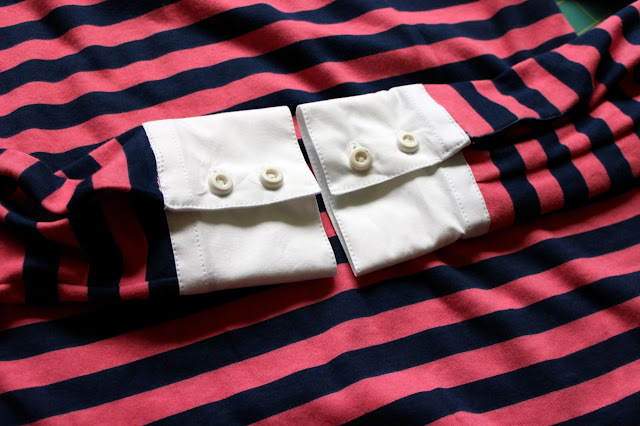 An Organic Cotton Striped Rugby Shirt! Readers, I just made my very first rugby shirt! Now, I know about as much about rugby as I do cricket, croquet, lacrosse, jai alai, polo, and mahjong, which is to say, nothing at all. 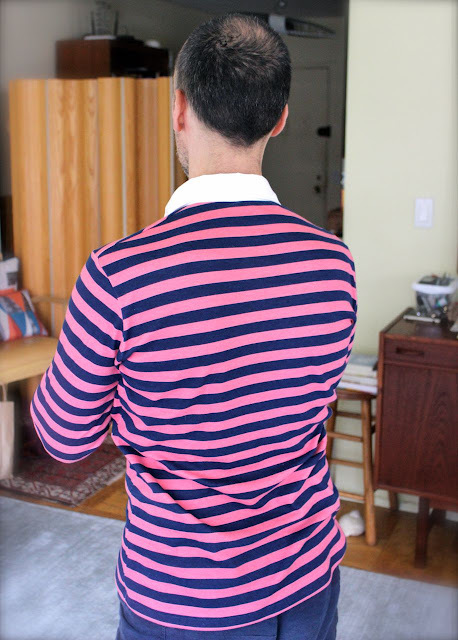 But I do like the preppy look of a striped rugby shirt. This summer the folks at the online fabric store Organic Cotton Plus reached out to me to review another project for them (you may recall my organic orchid flannel shirt from last fall). I was delighted to comply. 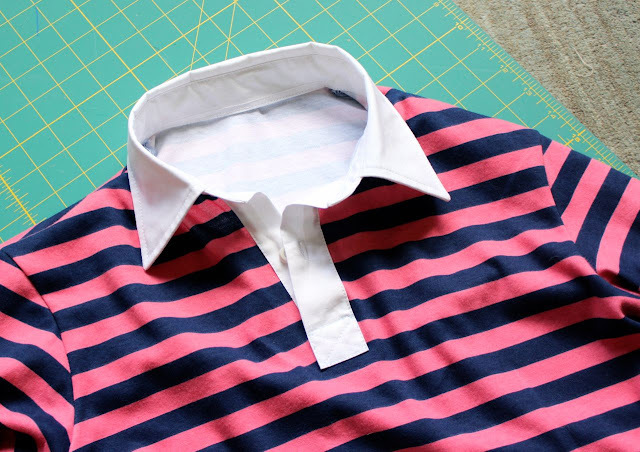 This time I chose a classic pink and midnight blue-striped cotton interlock to make a rugby shirt. Since I knew I'd need a sturdy woven cotton for the cuffs and collar, I chose a tightly woven, slightly stiff white cotton percale. I pre-washed (and machine-dried) both fabrics and both came out of the wash looking great. They also played well together. I'm always a little nervous sewing a woven and knit together. 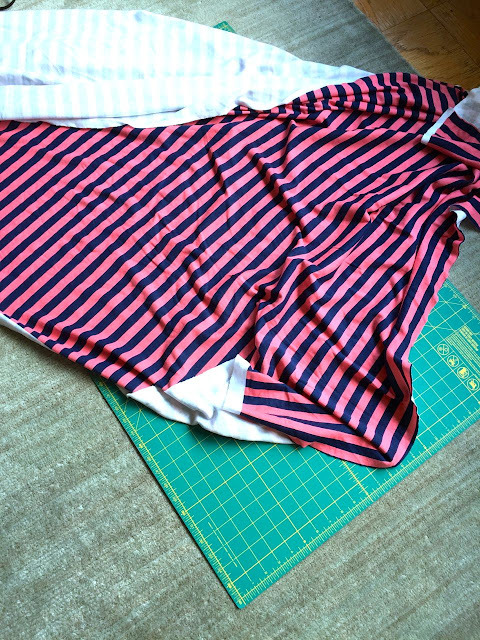 Luckily the interlock, while moderately stretchy, maintained its body throughout the sewing process. It has excellent rebound. 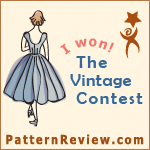 The pattern I used for my shirt is one of my favorites, vintage Butterick 4712. I'd been wanting to make the rugby-style shirt on the pattern envelope for years and here was my chance! 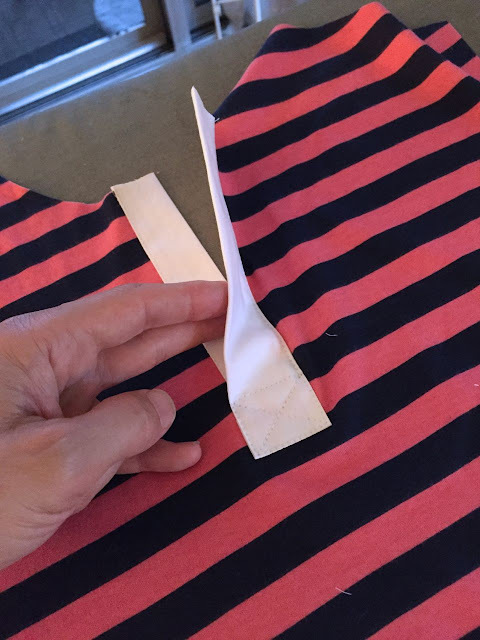 All my major seams are serged (with four threads), though I stitched them first with my sewing machine and used my walking foot attachment to help keep the stripes lined up. I reinforced the shoulder seams with rayon seam binding (cotton twill tape is another, somewhat sturdier, option). 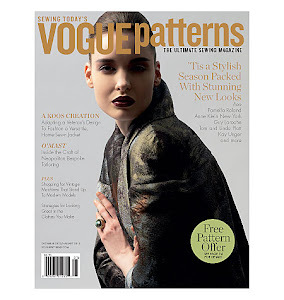 I made only one significant change to the pattern. Rather than use the center-front opening placket pattern piece (below right) which included a facing and attached to a one-piece collar, I traced the center-front placket pattern piece from David Coffin's classic book, Shirtmaking (p. 74), which allowed me to add a traditional collar and collar stand. I added two buttons to the cuffs instead of just one. The chunky white buttons are vintage plastic from my stash. 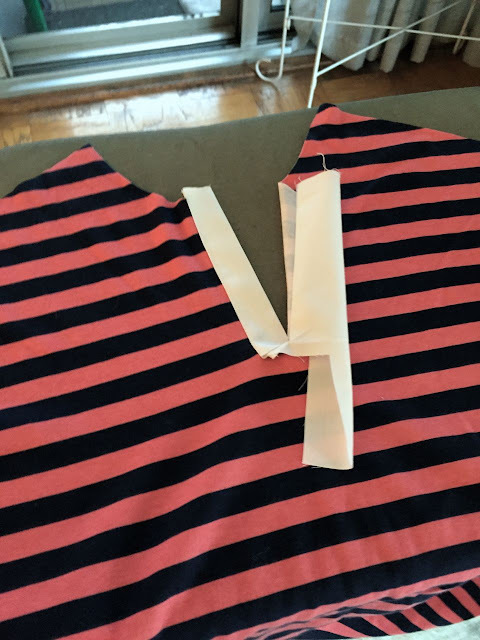 The shirt's hem is serged, folded under, and topstitched. Nothing fancy and very easy to accomplish. With the exception of my Brother 1034D serger, I made the entire shirt on my Singer 201. I think this is one snazzy-looking shirt. The cotton interlock is extremely soft and comfortable. 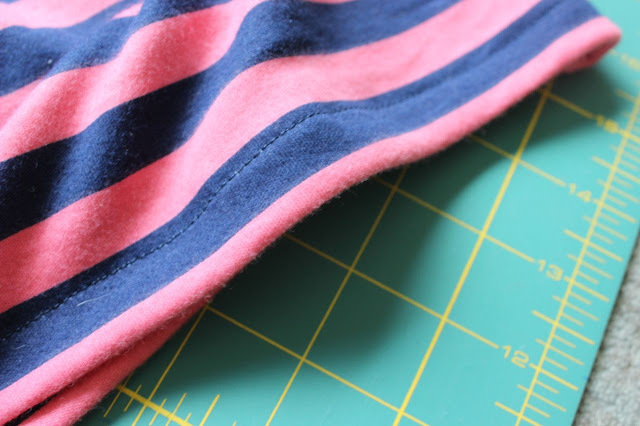 Although this stripe is printed as opposed to knit with two color threads (hence the "wrong" side looks white), the colors are rich and do not bleed. I recommend it without reservation. 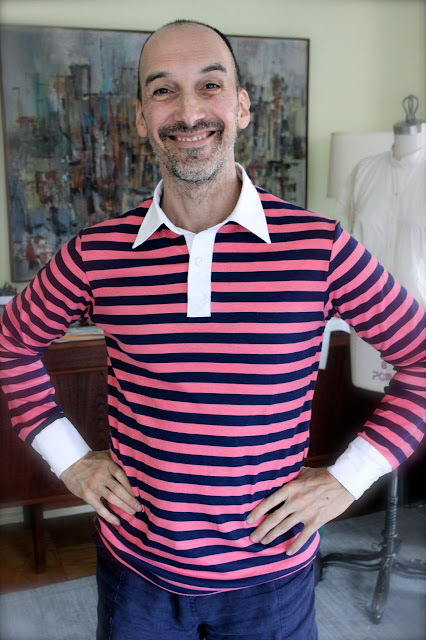 Since this is a long-sleeve shirt, I can wear it all year round -- and I intend to! 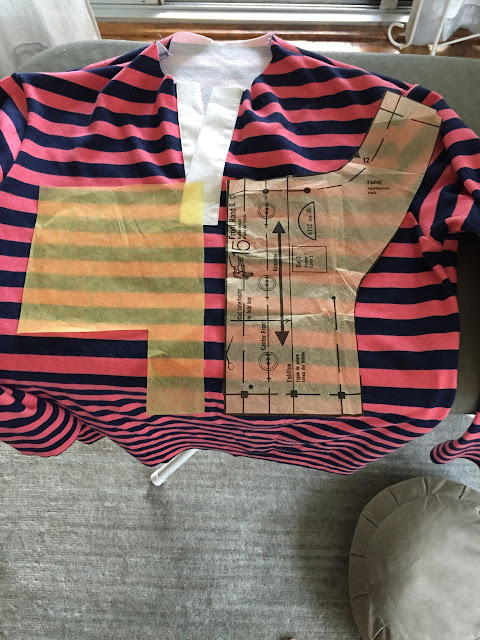 Ooh I have that pattern, I've only used the woven version for my pattern matching class, where I have to rip open all the shirt patterns to get the left fronts and pocket pieces out of them. But it is very styley! Nice rugger shirt, what ho! Great looking shirt! Beautiful workmanship, as always. Looks wonderful. A little bit of a departure from your usual, but fabu as always. Bloody nice rugby jersey mate! Okay, okay I've had it..........it's confession time!! I just refuse to believe that you're making all these clothes at such a lightning fast rate!! Now admit to the fact that you have a whole slew of pixies, leprechauns and fairies helping you! Why it's just downright disgusting that you're so productive! LOL!! You have those "enchanted folks" working 24-7 in your apartment because they would be classified as illegal aliens and deported if they bust their hind parts for you! You little taskmaster you! LOL!!! I've had similar thoughts/doubts/suspicions about his counterpart, Laura Mae. My rants, until now, have gone un-echoed. Though, I suspect a name change is futile - it's as if she KNOWS me. They are like "Children of the Worn", although she's been using wool, so she's more "Children of the Shorn". At any rate, they seem to sew in lock-step, find one another, and "make things happen" (while the rest of us are seemingly sewing impaired). Be mindful of your thoughts, and actions. It's as if everyone else in the sewing community fell asleep at the same time, and awoke enchanted with Hug-Snug Rayon Seam Binding (you'll notice he mentioned, but did not use twill tape, when he's otherwise a stickler for authenticity - I've run out of red flags!). Missing your sewjo? Me too. Oh, Test let's just face the fact that we're just considered the two "crackpots" of the group and our rantings will go unheeded! LOL! I've finally finished a simple camp shirt after two weeks of finger numbing labor! Peter is working faster and with more precision than a leprechaun on crack!! All joking aside Peter........... I'm looking forward to your next project!! Oh Anonymous bless your little heart! I'm so glad that Test and I have been vindicated! So my theory of an "enchanted sweatshop" has some validity! Now if only the the 'Selfish Seamstress" would chime in! I could see it all now sordidly spread across the front page of the New York Post......mild-mannered blogger/sewist leading double life of heartless taskmaster! LMAO!! You know this is the first site I go to in the morning when I'm having my morning coffee.......and when he's on vacation I get downright cranky without his posts! Love you Peter! 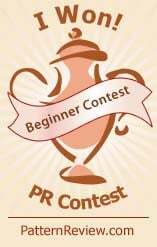 At the first MPB Parade, we'll have to share a float. Great looking shirt! I generally dislike cotton interlock, but this looks a bit beefier, so maybe that's my problem. Excellent workmanship, as always! Yes, beefy is the word for it! I am impressed you used the 201 for all but the serging. That's all straight stitch! 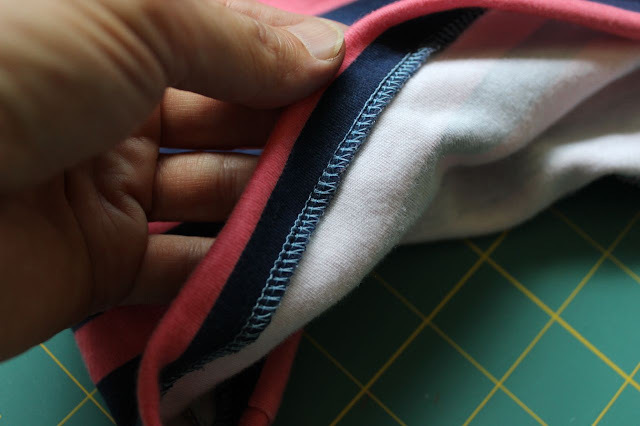 Of course you can stretch the fabric as you sew to get a little stretch in the stitch, but there you are with the walking foot and trying to match stripes- lots going on! Nicely done. That's a great looking shirt! I also use that placket from David Page Coffin's book for features like this. 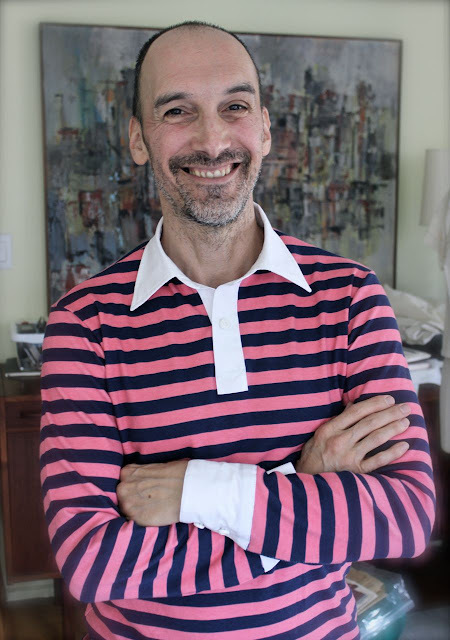 Once you've mastered sleeve plackets that way, it always works and looks great. That's just how I cut the sleeves, for better or for worse. 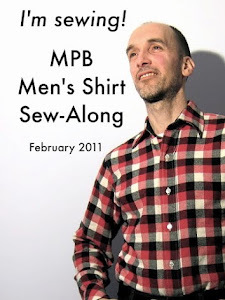 Congradulations Peter, I just read DPC new shirt making workbook. 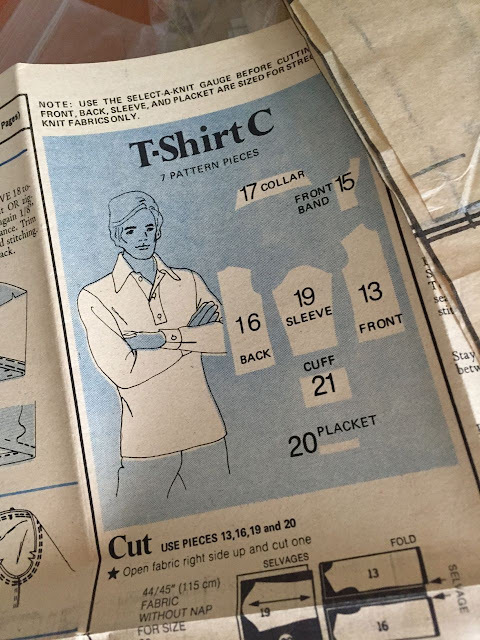 You got mentioned in the resource section for great shirt sew alongs. Your sewing and fitting skills are impeccable. Well done! I remember making that polo long ago. 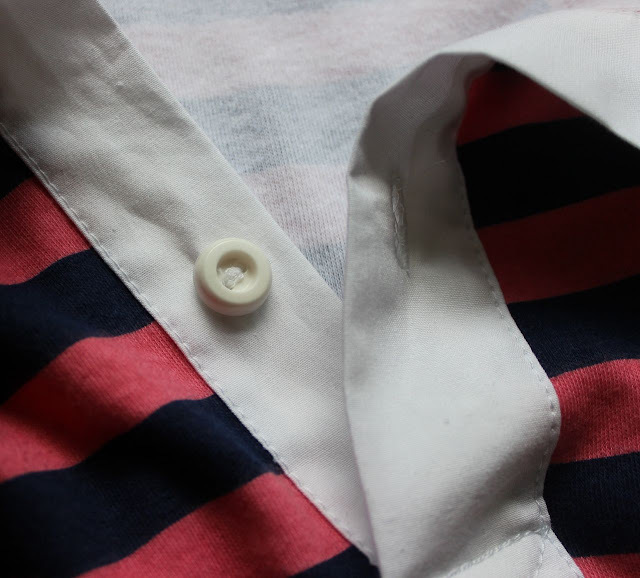 Would you show a picture of the placket piece you made? Flat and unfolded). Thanks! It's in the 6th photo from the top. The shirt is great, and you certainly have learned the colors that look best on you. 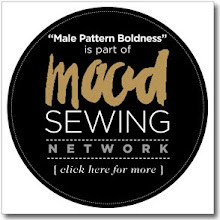 I was looking at an Etsy seller's offerings and came upon these two men's patterns. Absolutely love it!!!!! You are amazing!!!! I really love this! 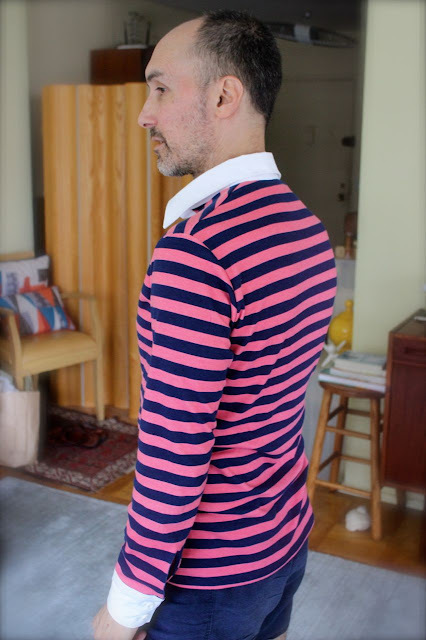 I had a pink and red striped rugby shirt when I was a teen that I adored and wore into the ground. This is such a fun take on the classic rugby shirt! Bravo! More Sewing Books? More Sewing Books! Zack Tries on His Shirt Muslin! Zack's Completed Paisley Shirt + My New Boxers! 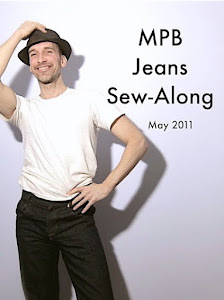 Come See My Completed Coveralls!